It’s been a lazy sort of day. Looking out the window, I see big chunks of snow falling from a cloudy sky. There’s no wind so the snow, which has been falling all day, is sticking to the tree branches and trunks. It’s beautiful. And time for comfort food; like pea soup, maybe. There’s no reason why I can’t share a couple of recipe ideas with you, though. One is from a blog I follow almost daily when I log my food on MyFitnessPal. They’ve set me up with some great recipes which I add to my database. When I’ve eaten that food for one of my meals, I go in and log from the recipe database. I love how easy that is. 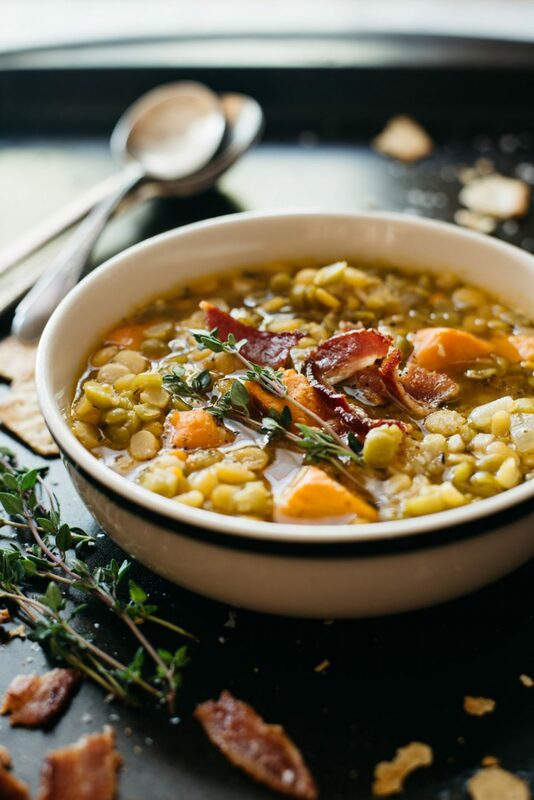 Here’s one, Split Pea Soup With Bacon, which came from the blog, HelloHealthy. I like ham in my split pea soup and most often use a good leftover bone with meat on it. That’s how my mom always made a soup with ham in it. This Canadian Yellow Split Pea Soup includes ham and might be more to your taste. Whether or not it’s snowing in your neck of the woods, comfort food may be exactly what you’re hungry for. As always, make adjustments to the recipes so they work for you.